Leading off today: Joe Girard III added to his lengthy list of boys basketball scoring records by putting up 69 points Friday during a 98-83 victory over host Schuylerville. Playing in what he termed "the most hostile and fun" environment of the season, Girard made 10 3-pointers and connected 17 of 21 times from the free-throw line in the sold-out gym. 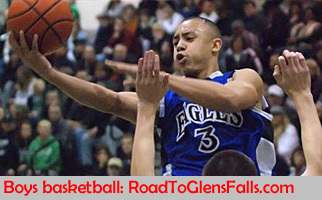 He scored 45 points in the first half as Glens Falls took a 58-45 lead. "Right after the game, people were telling me I had 70 points and I thought they were exaggerating," Girard said. "But now coming out here, realizing it -- wow. It is pretty cool and all, but the win is more important." Oh, brother: In the first Section 11 wrestling final between brothers since 1953 according to Newsday records, Port Jefferson's Rick and Anthony D'Elia faced off at 113 pounds of the Suffolk Division II championship at Center Moriches. Rick, a senior, got an early takedown and controlled the match en route to a 13-5 win and his third sectional crown in four years. "He's definitely improved and it's nice to see him here," Rick said. "I was really happy to have him in the finals with me." The last matchup of brothers in a Section 11 final came when Bay Shore's Jack and Bill Murray faced off in 1953. Max and Mike Soria of Kings Park qualified for the 103-pound final in 2010 but never wrestled. Skaneateles back on top: The New York State Sportswriters Association elevated Cortland/Homer into a tie with season-long leader Skaneateles in the most recent Division II state rankings. Barring further developments, Skaneateles will be taking back sole possession of the No. 1 spot courtesy of a 4-2 win by the Lakers in a head-to-head showdown. Skaneateles' Luke Lynn and Charlie Russell scored shorthanded in the first 12 minutes as Skaneateles broke to a 3-0 lead. 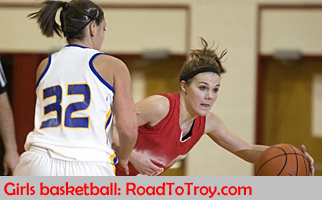 The teams will have first-round byes in the Section 3 Division II tournament. "I talked to (Cortland-Homer coach Chad Totman) before the game and we both agreed that we couldn't have a better game going into sectionals," Skaneateles coach Mitch Major said. "We both knew we had a bye and this is exactly what both teams needed." Girls final set: Skan- eateles and Williamsville will play for the NYSPHSAA girls region- al hockey championship Saturday in Buffalo. Skaneateles scored three times in the third period and earned a 3-0 victory over Plattsburgh in the semifinals at the HarborCenter on Friday. Williamsville powered past Potsdam 6-1 on the strength of an Emma Roland hat trick. Evie Sheridan made 24 saves for Skaneateles to earn the shutout. Williamsville was just two days removed from capturing the champion- ship of the weather-delayed Section 6 tournament. "We're all just so excited to get to this point," said Roland, a 31-goal scorer this season. "We knew that our trip wasn't over, and that our goal was to play tomorrow, and that's what's happening." End of the line: Two-time all-state basketball selection Declan Porter of Canton has seen his career come to an end due to a stress fracture in his right foot. Porter, who broke the school and Section 10 scoring records of Hal Cohen, finishes at 1,908 points. He was first-team all-state in Class B as a junior. Extra points: Frontier boys basketball coach Gary Domzalski will retire at the end of his 32nd season, the school announced Friday.